Alabama returns this week, with their 1992 release, American Pride. They do it again, providing Country-sounding music, the way Country music should sound like. Only one track from this album reached #1 - "I'm In A Hurry (And Don't Know Why." And, like many other previous #1 songs by Alabama, this one from American Pride adds another great song to hit #1. Not to say there should have been more tracks from this album to hit #1, Alabama still proves greatness with their albums, whether one song or more hits #1, or not. The album starts out with the great Country line dancer, "Take A Little Trip." (Once you get a song for Country line dancing, you know you've got a hit.) "Hometown Honeymoon" has your typical Alabama upbeat Country. "Once Upon A Lifetime" adds another tune to the list of great Alabama ballads. "You Can't Take The Country Out Of Me" proves that song is definitely Country-sounding song, with its standout song title. Add another song to the Alabama ballads -- "Richard Petty Fans." (Petty, being one of the popular race car drivers. He announced his retirement at the end of 1992.) And again, another great upbeat Alabama Country track follows, "Homesick Fever." Another Alabama ballad -- "Between The Two Of Them." One of the standouts for Alabama from their beginnings are their harmonies. The title track (as well as other songs) shows how great the members of Albama can sing. "American Pride" shows how Randy Owen & Co. can provide not just great Country-sounding music, but how their harmonies blend so well. "Sometimes Out Of Touch" is another great Alabama ballad. "Pictures And Memories" is another nice Country-sounding tune, and just like any song on this album, it IS Country. Alabama's American Pride is a great album. You can just easily add the Country group Alabama to the famous "American Baseball, Apple Pie, and Chevrolet." It's Country. It represents the U.S.A. Alabama has always been a great musical group. Great Country, great harmonies, great singing. Alabama IS Country. American Pride is no different than any of their past great albums. However, Alabama accomplished 11 #1 albums on the Billboard Country Albums chart. American Pride is NOT one of those #1 albums, but it should have. 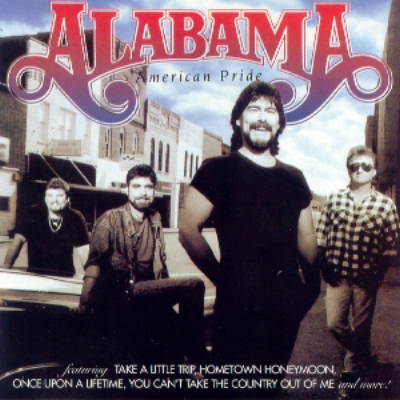 In either case, American Pride is another great Alabama album, just like any of their great Country albums. © WSVNRadio.net. All rights reserved. Review or any portion may not be reproduced without written permission. Cover art is the intellectual property of RCA/BMG Records and is used for reference purposes only.